Want comfort or relief from pain? For one week only, we’re offering you FREE UK delivery when you buy any Specialist Insoles. Simply add any product/s from our Specialist Insoles range and enter code WDINFP when prompted. With no painful ‘breaking-in’ period this squishy, ¾ length insole gives you immediate relief. Recommended by podiatrists it’s the only soft insole designed to combat Plantar Fasciitis. These dual-layer, shock-absorbing insoles are specially designed to improve underfoot comfort for anyone with diabetes, arthritis or very sensitive feet. Developed by a renowned podiatrist, Vionic gives you a cost-effective alternative to custom-made orthotics. They realign your feet and lower body and reduce over-pronation. Designed to fit Cosyfeet footwear, these supports for men and women help relieve pain and increase comfort by protecting and cushioning your ball of foot area. 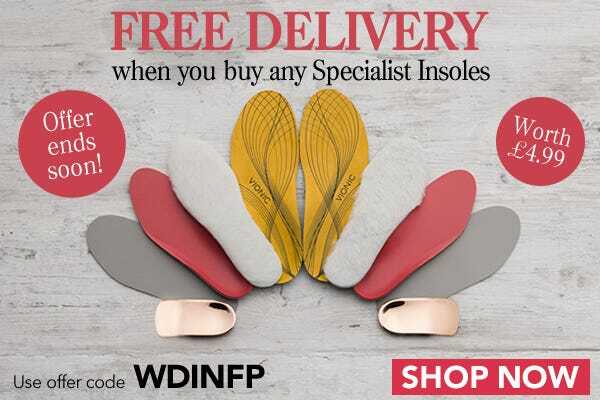 To redeem this FREE delivery offer (UK standard delivery), simply add any insoles from our Specialist Insoles range to your basket and enter the code WDINFP when prompted. Cannot be used in conjunction with any other offer. This offer expires at 11.59pm on Tuesday 15th November 2016. Offer only applies to products within our Specialist Insoles category. Offer only applies to in-stock items. We reserve the right to withdraw this offer at any time.